The bottom portion of the CB-100 has the standard tear-offs to color code the triage status of the patient. In addition, just above these tear-offs is a Triage Status Log to show if a victim’s/patient’s triage status changed during the course of an MCI. Efficient and effective triage during Mass Casualty Incidents (MCI) has proven to save lives. METTAG Medical Emergency Triage Tags have historically been used worldwide in MCIs ranging from automobile and aircraft accidents involving several victims, to large-scale terrorism incidents. With rising concerns of how to effectively handle triage situations involving HAZMAT, terrorism, and possible use of weapons of mass destruction, the need for an alternative triage tag has emerged. 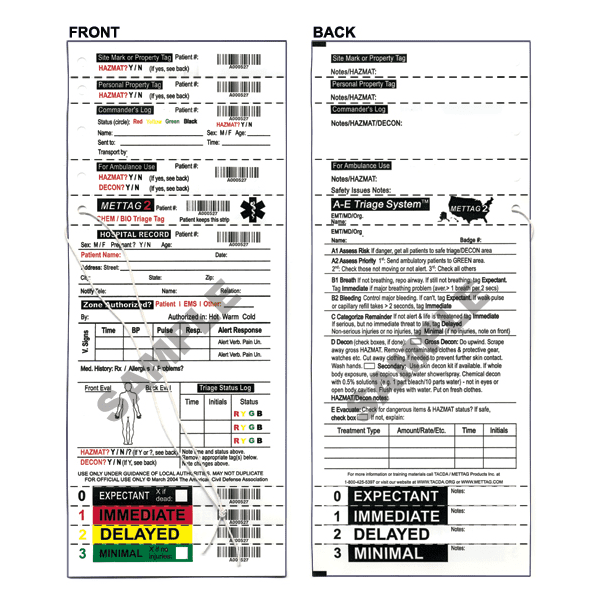 The CB-100 triage tag was designed to meet the needs of the first responders to the growing complexities and dangers of the modern triage environment. Constructed of the same high-density water resistant synthetic paper and printed using the same special thermal printing process as the Original MT-137, the front of the CB-100 has all of the key information fields needed to quickly note the triage patient’s status and to fill in additional patient assessment and tracking information as time permits. The back of the CB-100 provides room for additional notes about the patient, if needed. Each section of the CB-100 has the unique barcode serial number for tracking and monitoring the victim’s triage process. The top portions of the tag can mark a patient’s original location (as required in MCIs involving aircraft, etc. ), and can track a patient’s personal articles and/or body parts that may have been severed in an MCI. Other tear-off tabs near the top of the CB-100 are to be used for the Incident Commander or Triage Unit Leader’s log as well as to track how, when, and where a patient was transported for further treatment. The middle sections provide the receiving hospital or critical care facility with a permanent record of the patient’s personal information, medical history, vital signs, and initial triage status. 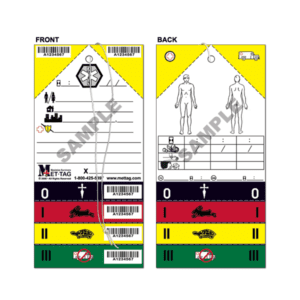 This middle section also provides a strip for the patient to keep, in order to help them track down their personal property, and will help to expedite triage actions if a first responder is injured while assisting victims at an MCI (first responders can fill in information about themselves prior to an actual MCI, such as medical history, name, contact information, etc., and then wear their own CB-100 when entering the scene). The CB-100 can be used with standard triage systems like the START method or with the A-E Triage System that is specifically designed to handle HAZMAT and terrorist incidents.